Steamers are sandwiches that hail from the western portion of Maryland, generally in the vicinity of Hagerstown, particularly in Williamsport. 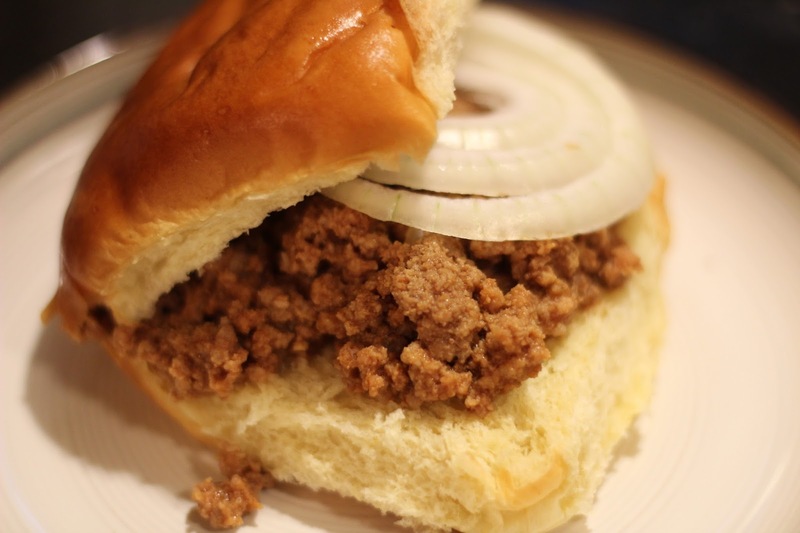 These sandwiches are similar to Loose Meat, Sloppy Joe, or Beef Barbecue sandwiches in that the ground beef is cooked until it is smooth and moist. Steamers, in particular, are unique in that they have fewer ingredients than the above and have a distinctly smoother texture. "The competition was the brain child of Jeff Cline, former Williamsport mayor and current Washington County commissioner. 'A steamer is more than a sandwich, more than a food group, it’s more than comfort food, it’s part of tradition of many people’s lives,' Cline said. Cline said when he was a kid, steamers were a special treat. He said his mother would tell him and his siblings that if they took their baths and went to bed, their dad would bring steamers home after working the second shift at Pangborn Corp. When their dad arrived after 11 p.m., his mom called up the stairs and the kids raced down to see dad and eat some steamers." The secret is to soak the ground beef in water before cooking until it is as fine as possible. As with any folk tradition, there will debate as the the "only right way" to prepare the recipe. For example, some say the meat should be highly spiced with black pepper and others say the meat should be seasoned very little; some use tomato sauce and others use ketchup; some like it thick so no sauce soaks into the roll and others prefer is saucy; etc., etc. To finish preparation of these sandwiches, serve them on buns with cheese, onions, and/or mustard. Note, there is, not surprisingly a debate as to the "right" sort of bun, with potato roll, traditional hamburger bun, or even just white bread being the most popular breads from which to choose and debate about. This recipe is from A Book of Favorite Recipes by the Residents, Staff, Family and Friends of Coffman Home For the Aging, 1304 Pennsylvania Ave., Hagerstown, MD, c. 1981. 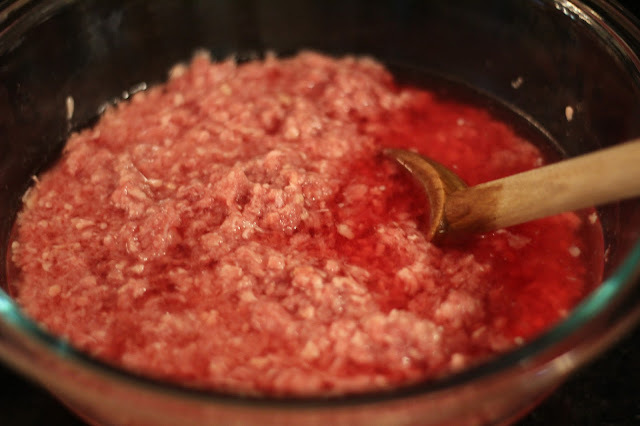 Place 1.3 - 1.5 Pounds of Ground Beef in a bowl and cover it with water. Use a wooden spoon to break down the clumps of beef. Let this sit for about 15 minutes, stirring it and breaking down the clumps frequently. Drain very well for at least five minutes to get all of the excess water out. The meat falls apart when soaked in water prior to cooking. Melt 4 tablespoons of butter in a saute pan and then add the onions, finely diced. Cook over medium heat for 10 minutes until they are just turning brown. Then, add the garlic and cook for another 3-5 minutes. Add the drained beef and stir well. Cook until the meat starts to brown. While the meat is cooking, mix together the tomato sauce with all of the other ingredients. Note: I did not know exactly what "basic sauce" was supposed to mean; I assume it meant Kitchen Bouquet, but I didn't have that so I used BBQ sauce. I found the recommended 1/2 teaspoon of salt not to be enough. Season after to your taste. Add the sauce mixture to the meat and cook on low for a long time, several hours;. Note: You can transfer this to a crock pot and cook on high for 3 hours or low for 6 hours. Serve on a bun of your choice with mustard, onions, BBQ sauce, hot sauce (my favorite), or cheese. Note: You can drain off some of the liquid for a less messy eating experience! Joe Crocetta, "It's simply steamer-licious," Herald Mail Media, July 29, 2015. Meg Partington, "Steamers ‘synonymous’ with Williamsport," Herald Mail Media, November 12, 2014.